Finally… ‘Candy Land’ The Movie! 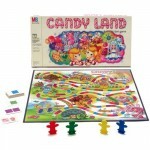 Universal Studios has announced that they will be going forward with a feature live-action movie based on the popular board game, Candy Land. The studio has hired Etan Cohen to the challenging duty of scripting a story to integrate into this ultra-sweet fantasy world we all know so well. Cohen has recently written the scripts for Madagascar 2 and Tropic Thunder, so when looking for someone to figure out a funny and family-friendly storyline, he seems to be a pretty smart choice. Universal has also tapped Kevin Lima to direct the feature. Lima has plenty of family experience, having directed Disney’s Tarzan and most recently, Enchanted. I’m not sure that I can think of any other board game that hits a nostalgia point like Candy Land does, so this is actually pretty exciting. Obviously the game wouldn’t be quite as fun today is it was in 1989, but I really think that if they do this right, it could be a pretty fun little fantasy movie; maybe like an edible Chronicles of Narnia! This is just another property of Hasbro (also including Transformers and G.I. Joe) that will push through to a cinematic reincarnation. No word yet on start of production or a release time frame.